Racehorses of 2009 said Showcasing (GB) “put up the best performance in the race in nearly 20 years” in winning the Gimcrack Stakes-Gr.2 (6f) at York in a juvenile record time of 1:09.28. The son of Oasis Dream cleared out to win this speed test by two lengths and his efforts that season earned him a Timeform of 117, putting him among the top 12 of his age group in the UK. Luckily for breeders in both hemispheres he has passed on this speed and precocity to his stock. He was Leading First Season Sire in GB/Ire in 2014 and NZ’s Champion Sire of Two Year-Olds and Leading First Season Sire in 2014-15. He is again starring as a leading sire of juveniles in Great Britain/Ireland to late October with 18 winners of 30 races and his northern fee at Whitsbury Manor Stud will rise to £25,000 in 2016. His current fee at Haunui Farm in NZ is $NZ10,000 plus GST and his NZ book is limited to 125 mares. A typical precocious product of the Danzig male line, Showcasing (ex Arabesque by Zafonic) won two of his four starts at two, the other being a maiden at Newbury by 2.5 lengths, and raced a bit too freely on unsuitable loose ground when third in the Middle Park Stakes-Gr.1 behind Awzaan. He was also beaten a head on debut in a 6f maiden at Newbury by another newcomer in Arcano (Oasis Dream). The winner, who shares the same sire as Showcasing, would remain unbeaten in his three starts at two including wins in the Prix Morny-Gr.1 and July Stakes-Gr.2. Showcasing’s four efforts at two for rider Jimmy Fortune were enough for the Timeform crew to state the youngster “should hold his own in the top sprints” the following season. did not race again and was retired to Whitsbury Manor Stud in 2011 before shuttling to Haunui Farm for the southern season in NZ. His first crop foals hit the ground running in the UK and NZ and included Group winner and Breeders’ Cup Juvenile Fillies Turf-Gr.1 fourth Prize Exhibit (Inchinor), Newbury Mill Reef Stakes-Gr.2 winner Toocoolforschool (Hector Protector), Group winner and Gr.1 placed Cappella Sansevero (Royal Applause) and Listed winner Accipiter (Silver Hawk) in the north. His first crop NZ winners included the Wakeful Challenge Stakes-Gr.2 winner Showboy (Thunder Gulch) and the Karaka Million-RL winner Hardline (Housebuster). To late October he had 75 winners of more than $4.5m in both hemispheres and his nine stakes winners represent 5.9% of starters. His stock’s Winning Distance Index is 1224m. His juvenile stakes winners in the north this year include the Newmarket Cornwallis Stakes-Gr.3 winner Quiet Reflection (Haafhd), French Listed winner Maximum Aurelius (Deputy Minister) and Newbury Rose Bowl Stakes-LR winner Tasleet (Cadeaux Genereux). His stakes placed two and three year-olds are out of daughters of Barathea, Medicean, King’s Best, Acatenango, Exceed and Excel, Fusaichi Pegasus, Celtic Swing, Cadeaux Genereux, Distant View and Rainbow Quest. He is second behind Lope de Vega on the second crop list (ahead of Zebedee) for Great Britain/Ireland with 37 winners of £781,175 to late October. Yet another top class runner from the Green Desert (Danzig) line, Showcasing is a son of Oasis Dream, a top class two year-old in England where his two wins from four starts included the Middle Park Stakes-Gr.1. He was Champion Two Year-Old and the highest ranking juvenile in Europe (123) on the 2002 International Classification and went on to become World Champion Sprinter (rated 125) at three when his two wins from five starts were the Nunthorpe Stakes-Gr.1 (5f) at York and the July Cup-Gr.1 (6f) at Newmarket. He was also runner-up in the Sprint Cup-Gr.1 at Haydock Park and third in the King’s Stand Stakes-Gr.2 (5f) at Royal Ascot. Classifications, the highest rating to that time. His European stock included English Derby winner Commander in Chief and he was exported to Japan to continue a successful stud career. Bahamian won the Oaks Trial-LR at Lingfield and was Gr.2 placed and produced seven winners and her other descendants include Gr.1 winner and sire Coastal Path. Her dam, Sorbus (Busted), won at two and was relegated to second in the Irish Oaks-Gr.1 when first past the post. She was also runner-up in the Irish 1000 Guineas-Gr.1, Irish St Leger-Gr.1 and Yorkshire Oaks-Gr.1 and produced eight winners including Irish Oaks-Gr.1 third Eileen Jenny and Listed winner Klarifi. Oasis Dream was bred and raced by Khalid Abdullah and trained by John Gosden. He retired to Banstead Manor Stud in 2004 where his fee in 2015 was £75,000 and he has had another spectacular year at stud with triple Gr.1 sprint sensation Muhaarar (Commonwealth Cup, July Cup, Prix Maurice de Gheest) and Goldream (King’s Stand Stakes-Gr.1 and Prix de l’Abbaye-Gr.1). His yearlings averaged £275,000 in 2015 (top £1.1m guineas). His lifetime winner to runners is 68.5% and stakes winner to runners is 11.4%. To early November Oasis Dream was credited with 588 winners of more than 1800 races and earnings of $64m and his 98 stakes winners include 14 at Gr.1 level. His elite level winners are Midday (Kingmambo), Yorkshire Oaks, Nassau Stakes; Muhaarar (Linamx) Champions Sprint, July Cup, Commonwealth Cup; Power (Inchinor), Irish 2000 Guineas, Curragh National Stakes; Goldream (Machiavellian), King’s Stand Stakes, Prix de l’Abbaye; Tuscan Evening (Suave Dancer), Hollywood Gamely Stakes; Lady Jabne Digby (Niniski), Munich Dallmayr Preis; Prohibit (Warning), King’s Stand Stakes; Querari (Acatenango), Rome Premio Presidente della Repubblica; Aqlaam (Rainbow Quest), Prix du Moulin; Opinion (Sadler’s Wells), ATC The Metropolitan; Jwala (Indian Ridge), York Nunthorpe Stakes; Arcano (Daylami), Prix Morny; Charming Thought (Indian Ridge), Middle Park Stakes and Naaqoos (Machiavellian) Longchamp Prix Jean-Luc Lagardere. Sheikh Albadou and Tamarisk (all Gr.1 winners) as well as leading NZ sire Volksraad (GB) and Desert Sun (IRE) (sire of champion Sunline and broodmare sire of unbeaten champion Black Caviar). Retired from stud duty in 2011, Green Desert left 94 stakes winners and 745 winners and is also a noted broodmare sire, one of his daughters producing Gr.1 winner and NZ shuttler Makfi (GB) (Dubawi). Showcasing’s dam Arabesque is a daughter of Zafonic (Gone West) and Prophecy (Warning) and she showed plenty of speed on the track where her wins included the Pontefract Flying Fillies Stakes-LR. Her eight winners also include the Danehill-sired stakes winner Camacho, who is doing a really good job as a sire in the UK from limited opportunities. This seems a perfect pointer to choosing Danehill-line mares for Showcasing. closely related to Scenic (IRE) and from the In Reality (Man o’War) sire line. There are useful pedigree links here to Eight Carat, Vice Regal and the dam of Bletchingly when considering mares who might suit Showcasing. Prophecy is also second dam of 2012-13 NZ Filly of the Year Fix (by Iffraaj, a son of Zafonic). Zafonic (Gone West-Zaizafon by The Minstrel) was also bred by Khalid Abdullah and was undefeated as a juvenile when rated Europe’s Champion Two Year-old after winner the Prix Morny, Prix de la Salamandre and then the Dewhurst Stakes at Gr.1 level. Beaten a short head by Kingmambo first up in the Prix Djebel at three, he defeated Barathea next time out in the English 2000 Guineas-Gr.1 at Newmarket, scoring by 3.5 lengths and breaking a 45 year-old course record in the process. He stood at Banstead Manor and left champion Xaar, Count Dubois, Zee Zee Top, Zafeen, Trade Fair and Iffraaj. Zafonic died at Arrowfield early in the 2002 southern season after a paddock accident. He sired 362 winners (53SW) of $40m and had a high (10%) ratio of stakes winners to starters. His daughters have left 650 winners of $59m, their 60 stakes winners (5.6% of starters) including seven at Gr.1 level by the likes of Pivotal, Efisio, Alhaarth, Dansili, Sea the Stars, New Approach and Unfuwain. Zafonic’s sire Gone West is also a noted sire of sires and he is a son of breed shaper Mr. Prospector, while his dam is by champion Secretariat. The Gone West-Danehill cross has worked well in Australia with Golden Slipper hero Sepoy bred this way (Elusive Quality (USA)-Watchful by Danehill (USA)). Showcasing’s dam Arabesque carries the mare Tamerett 3fx3m via daughter Secrettame and son Known Fact, while Showcasing is inbred 4mx4f to Lyphard and 4m,5mx5m,5m to that horse’s sire Northern Dancer. He is 6fx6m to Native Dancer (dam sire of Northern Dancer) and 6mx6m to Somethingroyal via sons Sir Gaylord and Secretariat. Oasis Dream also carries a 4fx4m of Never Bend. This branch of the Green Desert line has worked well with Nureyev and with Danehill. Showcasing looks ideal for daughters of Zabeel (Sir Ivor/Nureyev cross) and mares featuring Danehill in their pedigrees. Of Showcasing’s northern stakes winners Prize Exhibit is out of a mare whose dam is by a son of Nureyev; Toocoolforschool’s dam brings in another line of Mr. Prospector and Never Bend; Cappella Sansevero’s dam brings in more Northern Dancer, including Lyphard, and Busted; Accipiter’s dam brings in another line of Roberto, Raise a Native and Secretariat; while Quiet Reflection’s dam (who carries a double of Noholme) brings in Orpen (by Danzig and from Danehill’s family) and Sir Ivor and another line of Busted. His NZ stars Showboy (dam has Storm Bird and Nijinsky, who feature pedigree links to The Minstrel) and Hardline (second dam inbred 3mx3m to Sir Ivor) have dams who also play to strengths in Showcasing’s pedigree. Showcasing hails from family 5j and his eighth dam Schwester (Pennant-Swinging by Broomstick) is a sister to champion Equipoise (29 wins in 51 starts) sire of Kentucky Derby winner Shut Out in only four seasons at stud. Showcasing’s third dam Andaleeb (Lyphard) won the Yorkshire Oaks-Gr.3. This is the family of Mom’s Command, Be My Native, Chompion, Pia Star and more distantly of Sea Biscuit and Intentionally (sire line of Warning). 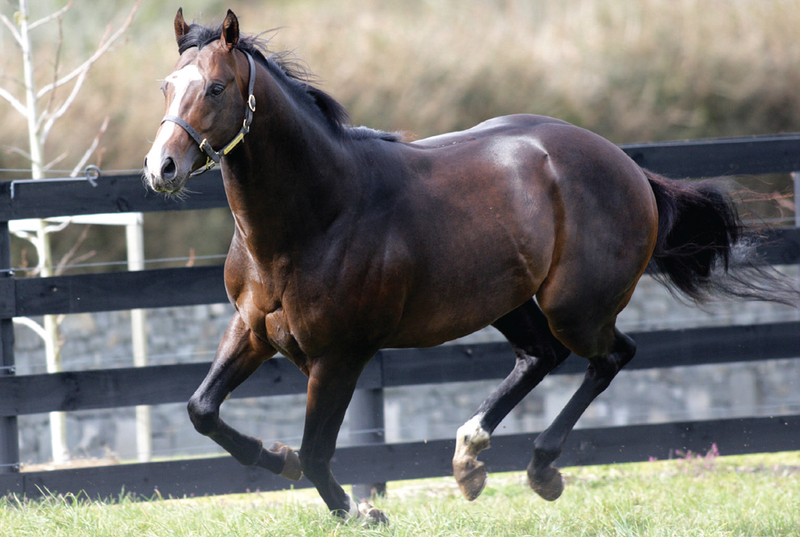 As a speed horse from the Danzig line, Showcasing has always been popular with NZ breeders. He covered more than 450 mares in his first four NZ seasons (2011-14) and is again working through a solid book in 2015. His success as a sire of two year-olds should again have buyers lining up to inspect his stock at Karaka in 2016.